The year 2018 is the sixth year for this team centered on the Harbord Village community which has been Rusty Dragon's founder Tim MacFarlane's home for 35 years. While recruiting will focus on registering paddlers who live or work in the area, it is not restricted in who can join the team. NO experience is required in any way. 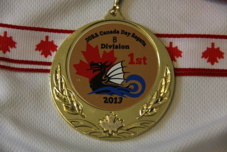 Our coach will take you from never having sat in a dragon boat to racing on Canada Day. The objective is for this to be a fun experience for everyone (men or women of ANY age, and young adults aged 14 and up). RECRUITING IS OPEN FOR ANYONE INTERESTED IN THE GREATER TORONTO AREA - NO EXPERIENCE IS REQUIRED. 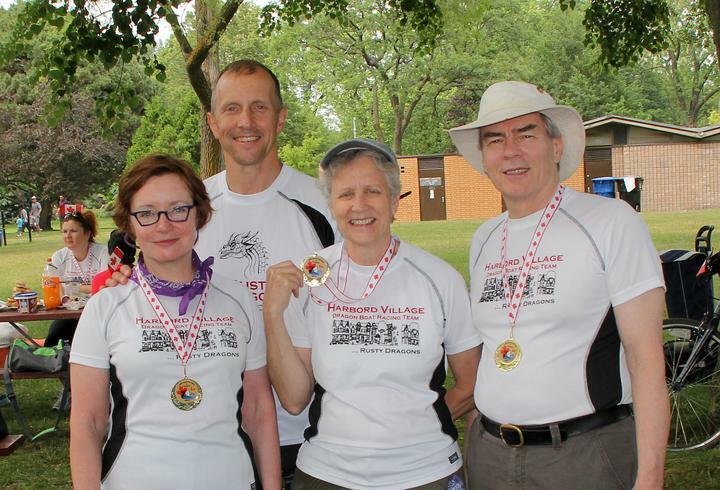 This team will race at the 135th annual DDRA Canada Day Regatta at Toronto's Centre Island on July 1st (YES, 135th annual - it started in 1884 for canoe/kayak and rowing teams, and dragon boats were added in 2003). 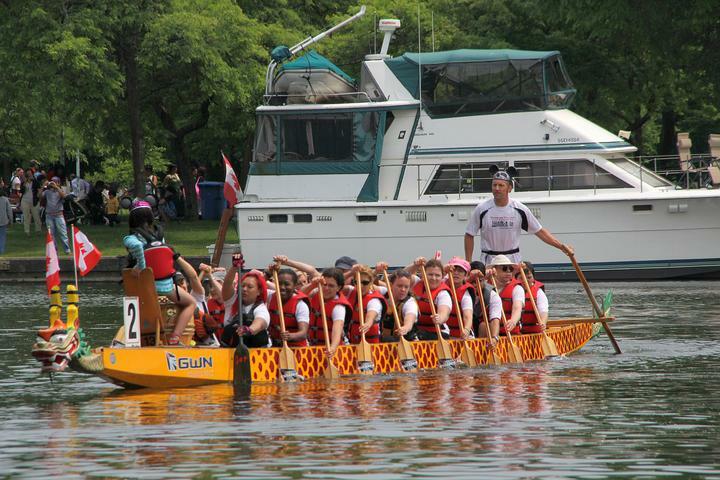 The non-profit registration fee includes all practices and race day as well as use of life jackets and paddles. 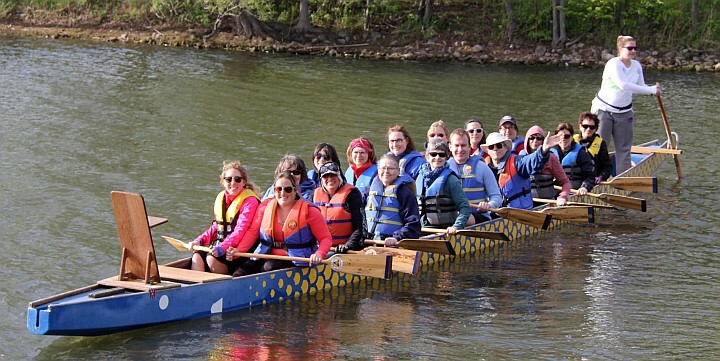 It also includes a $5 donation in support of the Spirit Challenge teams at the DDRA Canada Day Regatta (teams for individuals with developmental disabilities). l Dates: Thursdays, May 10 / 17 / 24 / 31 and June 7 / 14 / 21 / 28.
l Date: Sunday July 1st (Canada Day). The day starts at 8:00am and ends about 5:00pm. for more options including Interac e-mail transfer, cheque, and cash. Note that $5 from this fee is a charity donation towards Spirit Challenge teams. The decision has been made that this team will proceed with recruiting and preparing for their first practice on Thursday May 10th. 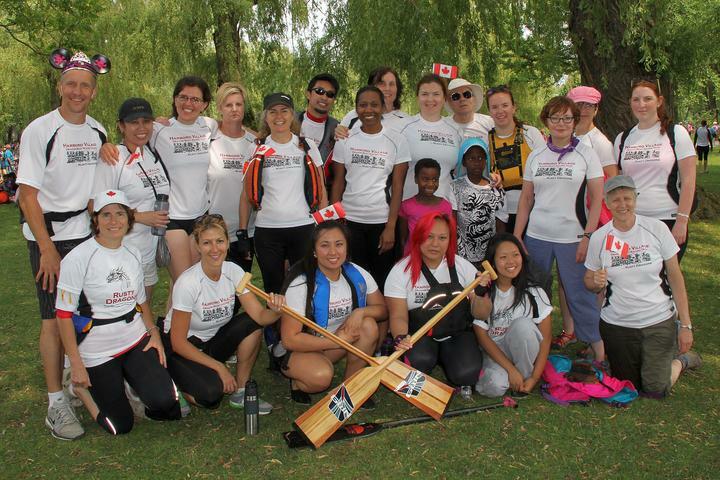 This team WILL NOT BE CANCELLED and we urge interested paddlers to register. An recruiting drive via various methods is underway (FaceBook, E-mail, MeetUps, etc). We will have guest paddlers from other teams join us until we have a full regular crew. This practice time slot is also open to guest paddlers from other teams (Motley Crew, Pink Crusaders, U of T Library of Conquest, One Gorgeous Boat, MTCS Oars to Discover, LP Dragons, OPS Diversity EANG Dragons, etc) who want the extra practice. We are reducing the drop-in fee from $15 to $5 for this time slot for paddlers on other teams. The MeetUp fee is still $15 as the club overhead is not covered for them as they have not yet registered with an existing team (whose registration fee includes a small club overhead component). ​Photo above (2013): A great picture of the Harbord Village team coming into the docks immediately after one of their their 500m races at Centre Island. All in SYNC and SMILING! That's what it's all about!! Coach Tim at back and daughter Sarah on drum. - Send interac e-mail transfer to "Payments@RustyDragons.ca" using any password as auto-deposit is enabled. - Send cheque to "Rusty Dragons Adventures" (and mail to: 76 Brunswick Ave, Toronto, ON, M5S 2L7"). - Send payment via credit card over phone (contact for details). - Pay online via PayPal account or credit card using button above (which will have a $3 service charge added).